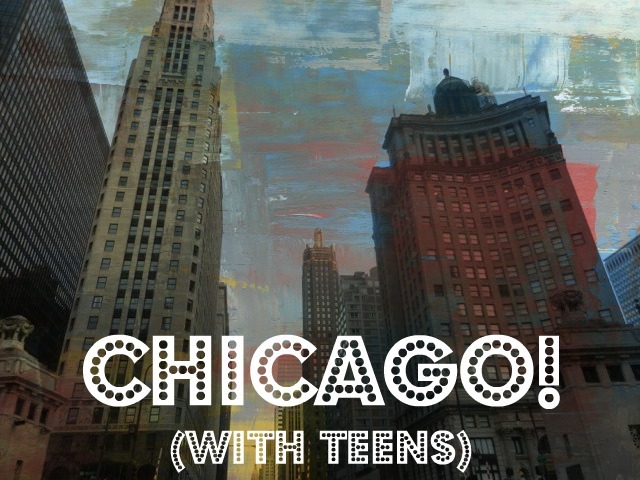 Over the summer, under the influence of my commitment to travel more, I took my teen daughter and two of her friends to Chicago. You can head over to this post to read about our first day in Chicago. The first afternoon included lots of walking, shopping, and getting an overall view of the city. The second day we had two specific goals: The Art Institute and Navy Pier. But first: getting there. My friend Andria, with whom we were staying, and I had thoroughly examined the Chicago Transit Authority's maps the previous night, and she made detailed notes for me about which lines to take. This was no easy feat: the print is so tiny on the maps that we seriously needed a magnifying glass to read it. And I'm not just saying that because we are in our 40s! Really, Chicago: large print is the way to go. Did I mention the record-breaking temperatures in Chicago during the three days we were there? That is an important travel tip: it is freakin' hot anywhere when the temps stretch from 95-105. Dress accordingly. Wear your hair back in a ponytail. Drink lots of water. Eat gelato. But don't put off your trip just because it's hot. All that to say: we walked many blocks to get the El, which of course is the Chicago way of saying "subway." It's also called the "rail." Whatever. We found it! The El experience was much different than our subway experience in NYC. I just assumed that there would be a subway stop at pretty much every block, like in NYC; however, the Chicago El system is much smaller than New York's. So, we actually had to walk probably a mile to get to a station. We were greeted by a worker there who immediately tagged us as tourists, took my card and swiped it and gave us our tickets. Yes, I thought to myself, "Why did I just let that man swipe my card? What if he is only a man dressed up in a Chicago Transit uniform and he's really stealing my identity?" But alas: he told us to run and catch the next train, which we did. It all happened very fast. Faster than I could really think, which might have been to our benefit. The ride cost us each $2.25. There are, of course, passes that can be purchased that might be less expensive. You can get an unlimited day pass for $5.75, which would allow for unlimited bus and/or rail rides on a single day. I opted not to do that because I didn't think we would be riding more than twice. As it turned out, we each paid for 3 total rides, but that was a goof on my part. More on that later. The ride was uneventful, and we did listen carefully to the CTA guy when he told us where to get off. We arrived a couple of blocks from the Art Institute and then had no idea how to actually get there. I'm sorry to say that all four of us are slightly map challenged. But we made it. Whoo-hoo! The line was fairly long. We arrived about 11 a.m. and obviously should have tried to get there an hour earlier, but those outfits were important. 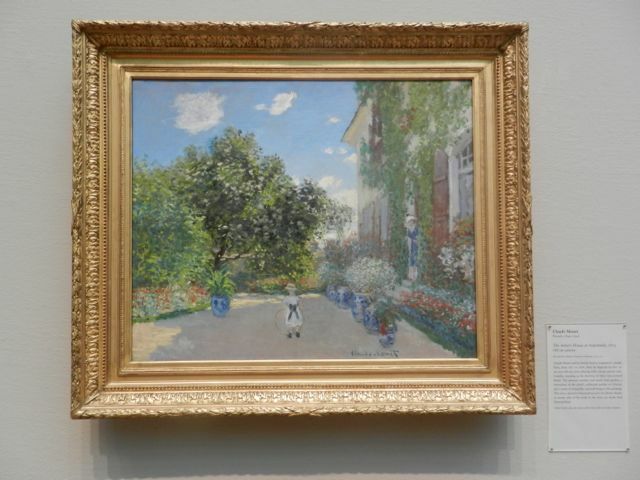 Like the Metropolitan Museum of Art, The Art Institute of Chicago has been on my to-do list for a long time. Maybe always. Last year my father and I flew out to Puget Sound say goodbye to my only aunt, his younger sister, before she passed away from ovarian cancer. 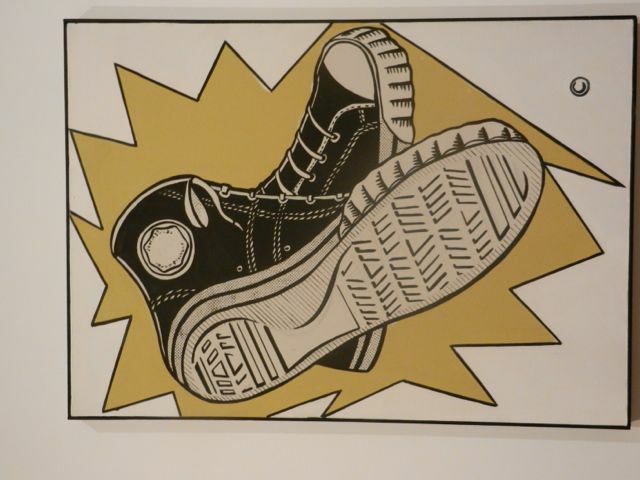 My aunt was an artist. She asked me to take any art books from her collection that I would like to have, and one of those I chose was an oversized book of the masterpieces in the Art Institute. I knew I needed to go there soon, partly in tribute to my Aunt Ann. And sharing art with my daughter—and her friends—was a priceless experience. As I said in my post about the Met, my daughter recently finished a year-long art history class at our co-op. 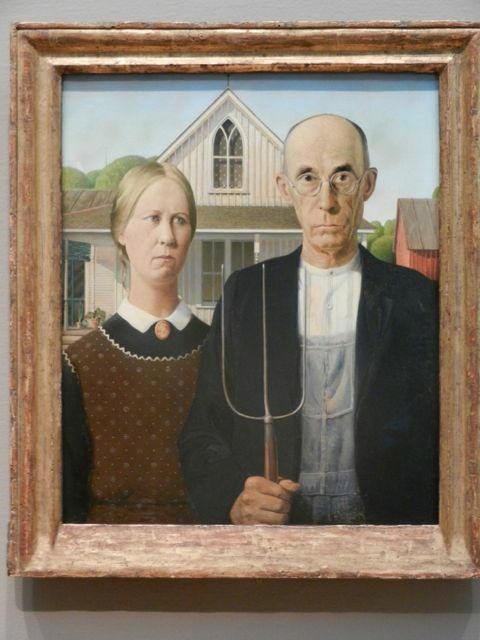 Their primary textbook was Short Lessons in Art History: Artists and Their Work. Having that familiarity was wonderful. Those are just a few, a very few, of the treasures that left me awestruck and tremendously grateful. Another highlight for me was Marc Chagall's stained glass America Windows. Just amazing. 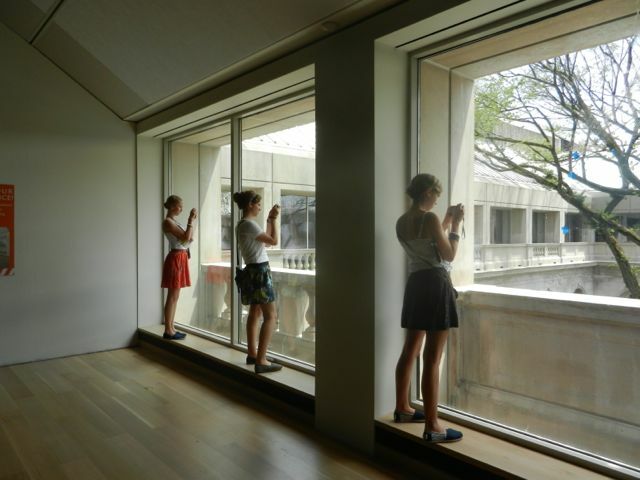 The girls loved the Architecture and Design wing. Honestly, I'm not sure I would have even visited that wing had the girls not wanted to, but I'm glad we did! I admit that we spent the vast majority of our time in the European masters. I can't help it. It is an awe-inspiring experience for me to stand before a painting that I have known all my life—perhaps first as a print hanging in my mother's living room, then as a student in college, then perhaps on a calendar or a card, then teaching to my children— and to realize this is it. This is the real thing. 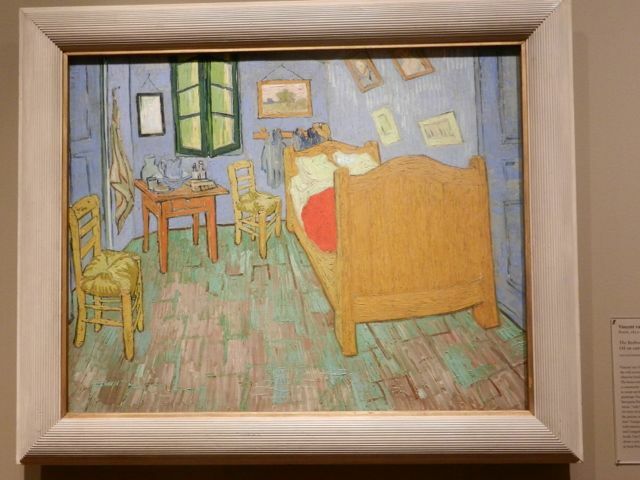 Van Gogh touched this, gazed at this, hated it and loved it. I get very emotional at such things. 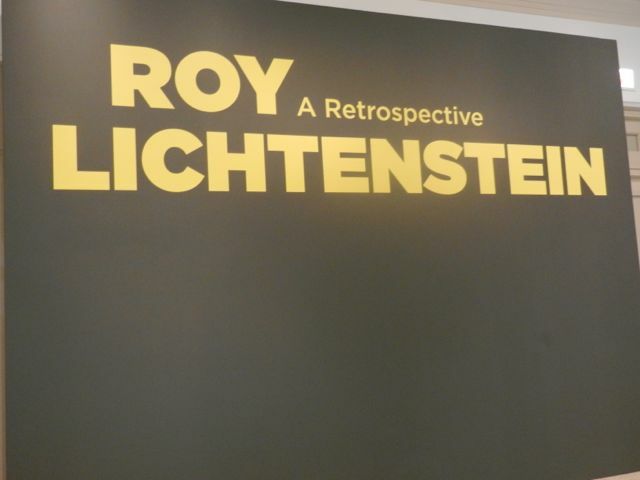 The special exhibit: Roy Lichtenstein. Wow! 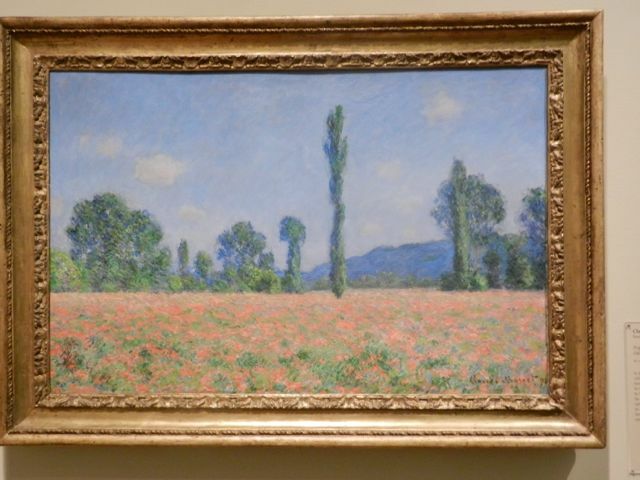 This is a big difference from my beloved Impressionists, but I loved it. 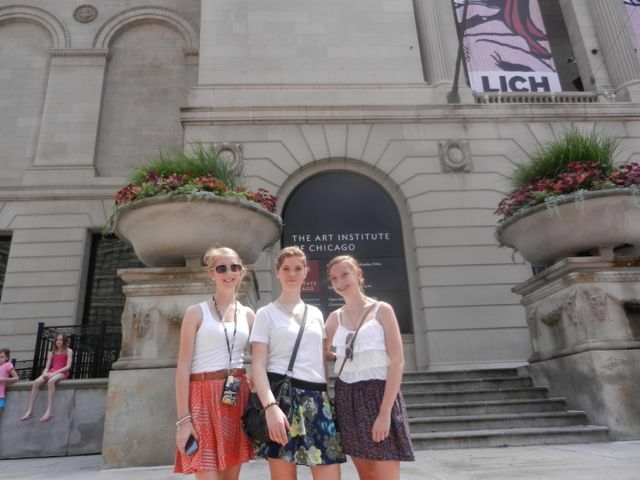 We spent about 4 hours at the Art Institute. We did decide to eat in the museum, although I swore I would never do that again after our experience at the Met. 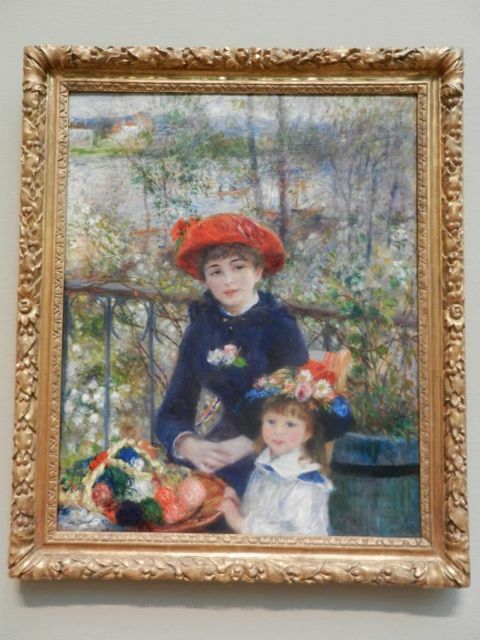 The Art Institute was less expensive by far, and it was worth the cost to stay in air-conditioning rather than venture outside into the Sahara to find food. Total cost: subway: $2.25/each. Museum admission: $18/adult; $12/student (under 14 free, but we didn't have any of those). Food: around $10 for mediocre food, but we were full. Next up: our afternoon inadvertently sightseeing on our way to Navy Pier. Thanks for sharing this. I am going to add it to our travel list. 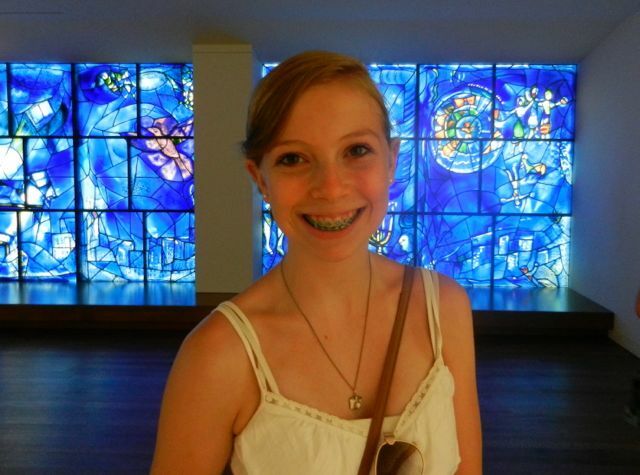 My 14 year old daughter and I are planning a DC trip this fall. Did the museum allow photography?